Coming to a hobby shop near you, the Take it to the House promotion in conjunction with 2015 Topps Football offers an exclusive set of NFL cards. View complete details on the promotion below, as well as a full checklist. 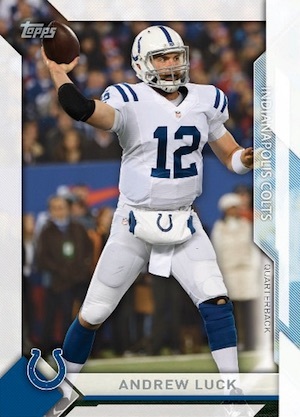 In order to qualify for the promotion, collectors must purchase at least $20 worth of 2015 Topps Football between August 26 and September 8 at participating hobby shops. This will earn the collector a redemption for a five-card Take it to the House pack that can be redeemed from September 9 through September 20. The 100-card base sets covers the past, present and future with a multitude of all-time greats, current stars and promising rookies. Although the odds or rarity was not provided, collectors can also find limited autographed versions in packs as well. Exactly half of the base checklist is included in the autograph set, with names like Marcus Mariota, Brett Favre, Barry Sanders and many others. While it is probably best to double-check with your local shop before you go, the full list of participating shops can be seen by viewing this PDF.